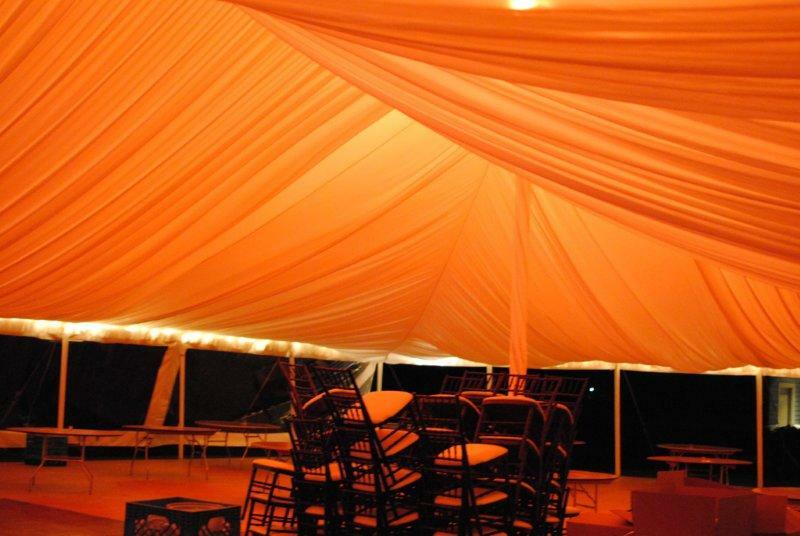 A full fabric tent liner adds style and class to any event! Add par car spot lights or a backlit effect to create a glow throughout the tent. Great for creating a romantic ambiance! Can also be paired with chandeliers for an added dramatic effect. With par can lighting, we are able to add layers of illumination to your event. Increased customization comes from choosing your own gel color. Or choose a color wash. Color washing is a technique used to transform an indoor room or tent into an enchanting environment. Lighting is an area where we really shine as a design team. We can create many auras with our lighting and decorating options and will work with you to create the ambiance you’ve dreamt of. Our staff illuminates and decorates your event ourselves, which allows us to be flexible and creative on your wedding day to ensure you get the look you want. We offer many different lighting and decorating options. Call for details or to talk about creating the custom look you want.